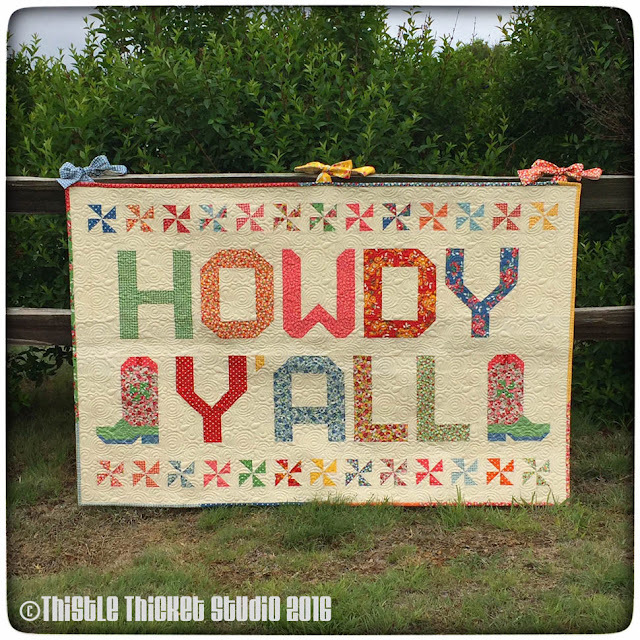 My second finish for the 2nd quarter of the 2016 Finish-A-Long is my Howdy Y'all Quilt. You can see my first Q2 finish here. And you can see my Q2 list of lofty goals here. I say 'lofty' since I only finished two of the nine that I listed. Oh well, two is better than none (or that's what I keep telling myself, but secretly I am disappointed that I didn't get more done on my list)! 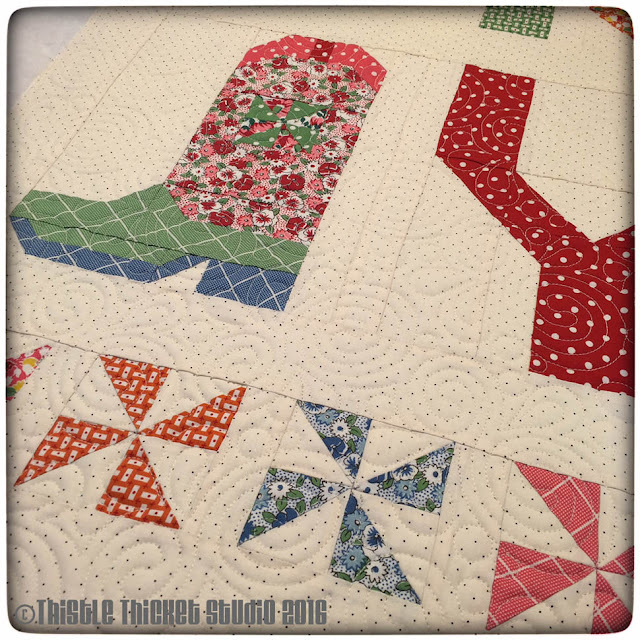 I designed this quilt for Moda Bake Shop's 7th Birthday Quilt-A-Long and the instructions to make the cowboy boot filler block was featured on MBS website here. This is the sketch of the design I submitted for consideration to Moda, which I later modified by eliminating the cowboy hat & fixing some spacing issues. 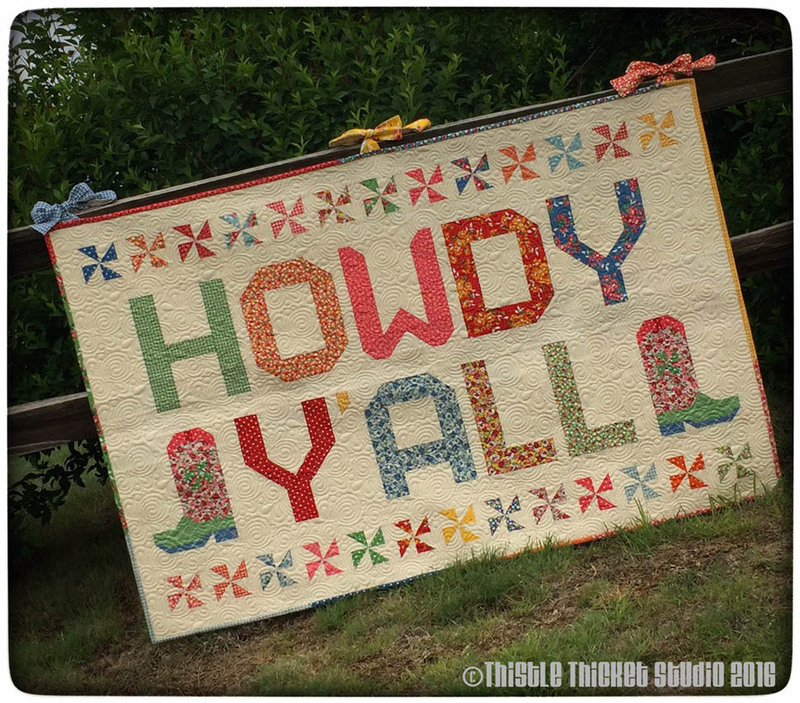 The project used the "Spell It With Moda" pattern for the letters and designers were to submit quilt ideas that included a "filler" block (mine was the cowboy boot) that would be featured on their website. I made this quilt with ties at the top so that I could hang it on my fence when friends and family visit our farm. I love it so much. I also love the quilting pattern I used on this one and the quilting really shows up nicely in the photos! 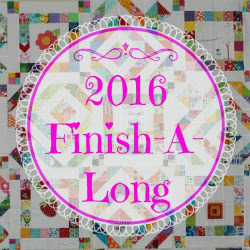 I'll be linking this post up for the 2016 Finish-A-Long on our host's She Can Quilt site. Someday, maybe - ha, ha, I'll be lucky enough to win a prize! Well, it's time to head back to my sewing machine and work on another one of my lofty goals that will now be on my 3rd quarter list! This is a really fun mini and it was neat to watch your progress with it on Instagram - I was also amazed at how quickly someone guessed what it spelled! I love the quilting on it, too. What a beautiful finish! 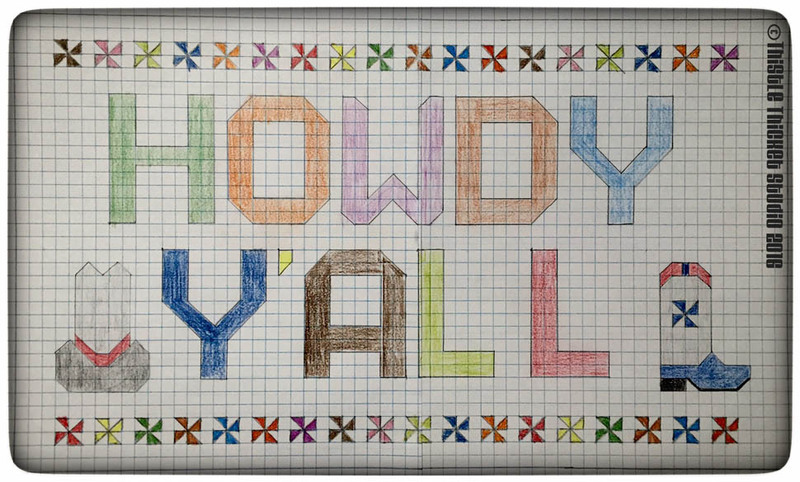 I love the way you use this quilt too, everyone should have a "welcome quilt"